Xylo on his favorite perch. Xylo doing his happy squirmy wiggle. How about a super-friendly cat?! 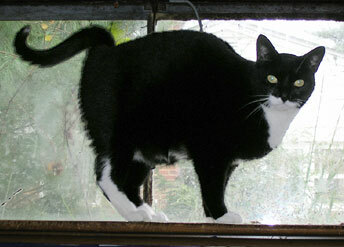 Xylo is a big, handsome, black & white sweetie. He was found at a 7-11 store in Manassas. The poor guy had ridden to the 7-11 in the engine compartment of a car he’d climbed into! His whiskers were singed but overall he was unharmed, just very confused & frightened. Big Xylo has a wonderful, easy-going & good-natured personality. He's very friendly, affectionate & expressive. 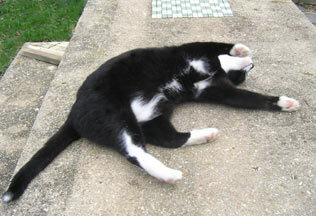 When he wants attention (which is almost always), he rolls & writhes around on the ground, purring & saying "mmmmrrah!". Xylo would be fine being an only cat. He doesn't care much for the company of other animals but he's not aggressive. He could adapt to other friendly cats & dogs but he's happiest being with friendly people instead. Xylo has a small white tip on the end of his tail, a dark black nose, 1 white whisker ever his left brow & white ribbons strips of white down his tummy. He's neutered, UTD on vaccines & tested negative for FIV & Fleuk. He's around 3 years old. Xylo is a bit chubby but is very energetic & playful. He loves attention & likes to sit on laps. 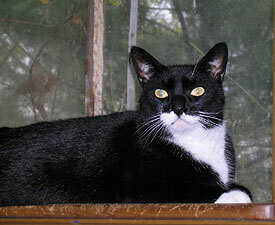 Xylo would do great in a stable home with friendly people & plenty of attention. This sweetheart knows how to welcome you ome after a long day!